The Bay of Valledoria in the middle of the north coast of Sardinia has an approximately 14 km of beautiful sandy beach with dunes and the lagoon of the river Coghinas. Our brand new apartment is on the 2nd floor of a modern apartment complex on a hill in La Mudizza at Valledoria and offers of the two balconies, a fantastic prints all round sea views over the bay of Valledoria and also in the mountains. La Mudizza has a supermarket, a stand with fresh fruit and vegetables, bars, restaurants and a small church. In our street there is a so-called Agritourismo mode, where you can go good local style food. The distance to the beach is about 1km, you can travel either by the beautiful nature walk, or you can park near the beach. 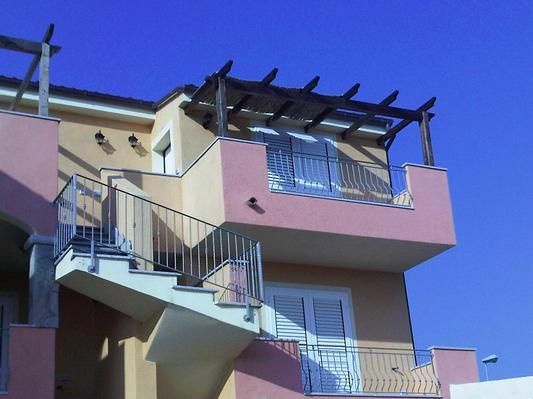 The apartment is about 55m ² and 2 balconies (1 large balcony facing the sea and 1 smaller for mountain / sea). It has 2 bedrooms, one with a double bed and the other is a closet, if necessary, the baby bed and a bunk bed. The bathroom also has a window with partial sea view, shower, toilet, bidet, sink and a washing machine neurdings. In the combined living and dining room is the brand new kitchen with gas stove, oven, dishwasher, fridge freezer, microwave and kitchen utensils for 6 persons. The living area is still a couch and a flat screen TV with 80 cm and a stereo. The apartment is located in a quiet area of town and making it ideal for seniors, children and pets. Activities: Surfing (! With appropriate wind and kite surfing), sailing, swimming, hiking, fishing, tennis, horseback riding, water skiing, snorkeling, jogging, mountain biking, rock climbing, canoeing attractions in the area: Castelsardo (pitoreskes town on the rocks) , Isola Rossa (beautiful bay with a small marina and red rock), Coghinas river with its lagoon and the sea bathing in the river, with its hot thermal springs at Castel Doria, thermal baths at Viddalba, archaeological museum in Viddalba It can also be arranged a babysitter or a collection and delivery service to and from the airport or ferry. In season there are also public buses.The use of linen and towels are included, also the baby-bed,if needed. Intermediate cleaning (once per object, Costs amounting to 25 EUR).